On the day of St. Valentine, deliver pure pleasure to a soul mate of yours with by gifting the individual this Primo Splendor Valentine’s Day Collection and tether heart-strings between you two. 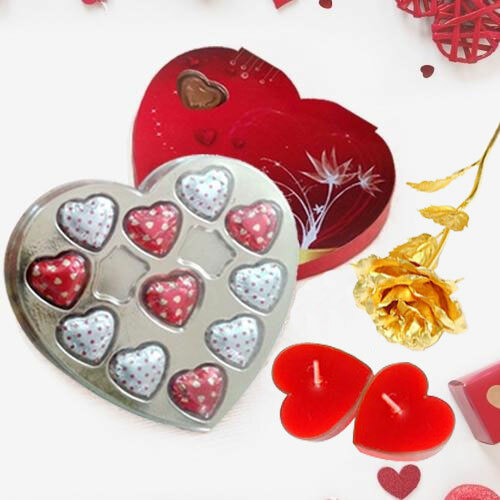 This thought-fetching Collection is sequenced with 1 zesty Golden Rose, 2 peachy Love Candles and 1 yummy Pack of 11 Heart Shaped Chocolates. Flowers Delivery Adilabad, Send sweets Agra, Wedding Cake Jodhpur, Diwali Mithai Madanapalle, Send Flowers and Gifts to Durgapur, Online Shop Mohali, Flower to Salem, New Year Flowers Kozhikhode , Fresh Fruits Goa, Send Gift Rishra, Dry Fruits to Jaisalmer, Birthday Delivery Mhow, Sending to Sangli, Flower shop Cochin, Vadodara Online Cake Delivery.